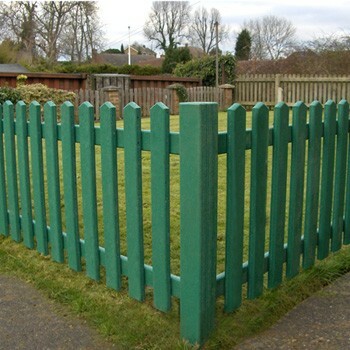 Solid Plastic Picket Fencing - a No-rot solution to this attractive traditional type of fencing. A very sturdy, solid, UV stabilised plastic material provides an extremely durable fence. As standard the pickets are each 610mm (2’ high) x 50mm (2”) x 25mm (1”) thick . Posts are 914mm (3’) high x 76mm (3”) x 76mm (3”) allowing for 305mm (12”) to go into the ground). The back rails are 50mm (2”) x 25mm (1”) and each panel section is 1.83m (6’) long. But they can be amended to suit requirements. The components are screwed together.